Regatta says:"The Breakbar is our men's high-wicking T-shirt for active days in the hills. It's light and cool enough to be worn alone on tough ascents in warm conditions or under mid and outer layers if the weather turns. It's made using a quick-drying fine mesh fabric that rapidly moves moisture away from your skin and has a 1/4 ventilation zip." Worn on trips to the Southern Lake District and the White Peak Alps (Chrome Hill, Parkhouse Hill) I must admit that I am very impressed with the Breakbar T-shirt base layer from Regatta. Part of Regatta's Point 214 range of more technical products, the Breakbar fits very well (I'm XL) and is long enough to tuck into trousers or shorts. It has short sleeves and no collar and a quarter length zip on the front. The zip is toggled for easy access with gloved hands and when fully home the zip slider sits inside a little flap of material making it very neat and tidy. The Breakbar is made from 100% quick dry polyester fabric and offers excellent wicking properties. I tend to run hot and sweat quite a lot when working hard, but the Breakbar coped well and I never felt cold and clammy. Even the area around my back where my rucksac made contact dried quickly during tea-breaks. For the sake of testing, I wore the Breakbar on several consecutive trips without washing it in between - and am happy to report that it performed well without becoming smelly. 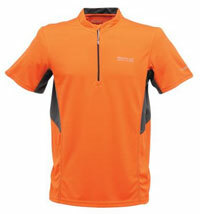 If you are looking for a good quality base layer that wicks well and looks great on the hill (I had the orange version) - then check out the Breakbar T-shirt from Regatta.